Happy Hump Day! I slept in and the sun was shining when I woke up which is honestly the best way to start your day. 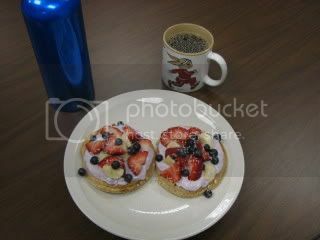 I started my day off with some healthy waffles packed with fiber, protein and a whole lot of yum! I checked off a dairy and fruit serving too – woohoo! All together with some decaf coffee and my SIGG. Did you all see Biggest Loser last night? Wasn’t it an awesome show…I LOVED all the make overs and was really torn about which person should’ve gone home. I felt like they both should have stayed. Today is going to be busy, but, it will all be worth it when I am off on Friday enjoying not working….more on that later! « Fun Stuff for My Blog…. I’m SUPER jealous, those waffles look AMAZING! Love the BL… seriously isn’t it motivating to see how hard they work! 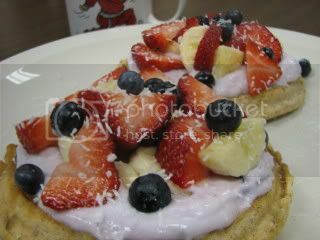 Dlish ~ I like the Kashi Waffles, but, they definitely need toppers. They have that healthy taste, but, if you top them just right, they are pretty good. Run ~ I absolutely agree! I always want to get up and workout after the show. Too bad they didn’t have repeats on in the morning for workout motivation. It doesn’t help so much at 10 PM at night lol. Caitlin ~ Yeah! Good to see you. Thanks for your info, I will send out your prize ASAP. I LOVE sleeping in when my body lets me. Sometimes I want to but I still wake up early against my will. lol.